"Am I really that ugly?" The Simpsons rush in as usual, but Marge wipes away the Matt Groening logo. Matt Groening writes it again. "Dodgeball stops at the Gym door"
"Pygmoelian" is the sixteenth episode of season 11. "After winning the chance for his photo to appear on a Duff beer calendar, but losing out when the calendar appears with stickers covering his face, Moe gets a face lift. The resulting surgery makes him handsome and then Moe takes revenge on those who wronged him because of his looks in the past, including the producer of a soap opera. Of course his new looks get him the part, until he and Homer become privy to some plot lines that threaten to write him out of the show. In anticipation, they decide to go out "in a blaze of sour grapes"." In the Simpson house, the smoke alarm is going off and Homer runs through the house waking everyone up because of a fire. They all get into the care and drive off where Homer reveals this was a plan to get them to the Duff Days festival early. The family enjoy the exhibits at the festival, with Marge being kept in a cage as she's the designated driver. Homer then goes to watch the "Duff Beer-tender of the Year contest", which Moe is participating in. Moe beats his competitors Titania and Michael Finn in the final round and wins the competition and gets his face on the next Duff Calendar. However, Phil Angelides, the Vice President in charge of calendars and fake IDs for Duff Beer, told Duffman that they couldn't put Moe's face on the calendar as he was too ugly. When leaving the festival, Marge buys an elephant balloon for Maggie. At Moe's Tavern, Homer delivers the new calendars to Moe. Moe is then saddened to find that they had put multiple stickers over his face. After peeling off all the stickers, he sees his photo and realizes that he's ugly. After his friends attempt to make him feel better, Lenny suggests plastic surgery to make him handsome. At the Simpson house, Maggie is playing with her balloon when Bart and Lisa get jealous and want it too. The balloon goes up the chimney and Bart and Lisa chase after it on Lisa's bike. Moe goes to visit Dr. Velimirovic to get a new face. Dr. Velimirovic told Moe that he would need a total tear-down of his face to make him look better. Moe agrees to this and gets ready to go to the operating table. After giving Moe new car smell rather than anesthesia, they successfully knock Moe out. Meanwhile, Bart and Lisa are still chasing after the balloon. The balloon flies into a building and Bart and Lisa abandon the bike to go up to get it. They enter a gay Republican meeting where they get the balloon back. After Moe's surgery, Moe goes to get revenge on everyone who insulted him because of his looks. He firstly went after Duffman, sticking a sticker over his face. He then went to see someone he asked out in school. After she apologized for the way she treated Moe, Homer threw a rock through her window and they ran. Moe then went to Channel 6 Studios to get revenge on Helen Morehouse and It Never Ends for rejecting him when he auditioned for the role of Tad Winslow. However, Tad Winslow's actor was fired that very moment and Moe was hired to be the new Dr. Winslow. 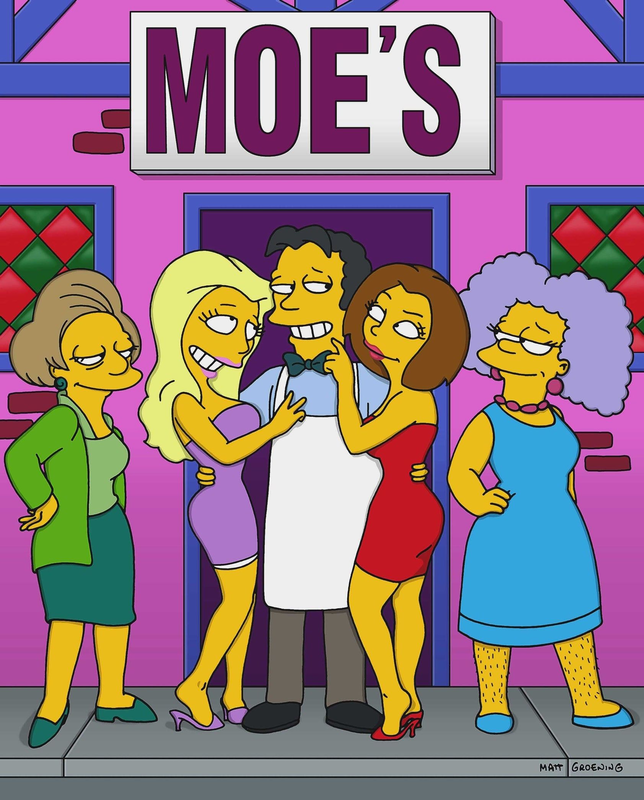 Moe became a hit with the ladies and was enjoying his role. However, he was then delivered some future storylines and found out that his character was to be killed off. Angry at this, he and Homer plotted to get back at the show. In another episode, Homer, dressed as an angel, came onto the set and read out several of the future storylines for the show. When Helen Morehouse questioned why Moe would do this, he told her that it was because they were killing off his character. Morehouse then told him that it was a dream sequence and his character wasn't really being killed off. Moe was then fired and was leaving the set when part of it fell down, landing on his face, reverting his face back to normal. Back in Moe's Tavern, Homer and Moe talk about his face, with Moe saying his face was too much maintenance. Moe then questions why his face went back to his old face. The episode was written by Larry Doyle and was directed by Mark Kirkland. The episode has received positive reviews from fans, since airing. Modified on July 4, 2018, at 10:44.